Once a season we think you should splurge on at aleast one fabulous handbag and one fabulous pair of shoes!! Rather thanby 5 pairs of cheaper shoes, invest in yourself and your closet!! 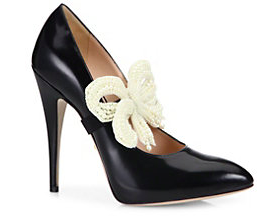 We are loving these Fabulous Gucci Heels with the over the top bow! Perfect for weddings or even that evening work event - dress them up or down! 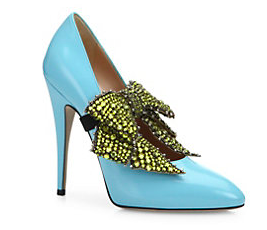 Better yet, you can wear them without the bow too, they are removable! If you have to keep it more classic, stick to the black and white ones - you just can't go wrong!! GIFTS HAVE RIBBONS, NOT STRINGS.